Attendees of the Gables Residential annual leadership program at Gettysburg on Little Round Top. Recently more than 20 employees from Gables Residential participated in the Gettysburg Foundation’s leadership training program, “In the Footsteps of Leaders,” at Gettysburg National Military Park. 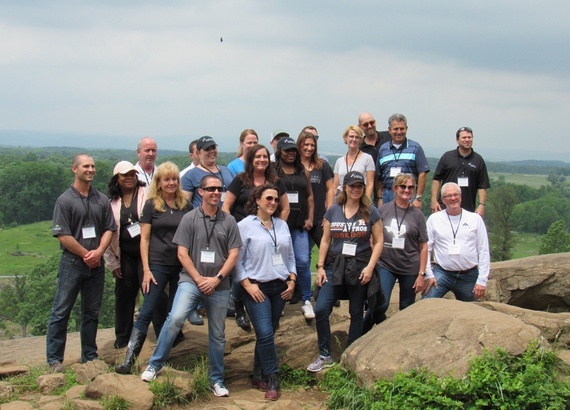 This is the fifth year that Gables sent a team to Gettysburg as part of the Gables Leadership Institute, which provides high-performing employees with a comprehensive leadership training program at various locations across the country. Facilitated by Dr. Jeffrey Kudisch, a Clinical Full Professor at the University of Maryland’s Robert H. Smith School of Business, and led by Sue Boardman, Director of the Gettysburg Foundation’s Executive Leadership Program, participants were treated to an immersive guided tour of the battlefield exploring the leadership styles of various personalities that played critical roles at the Battle of Gettysburg. Gettysburg Foundation thanks Gables Residential for five years of leadership training here at Gettysburg! Learn how your company or organization can take advantage of battlefield lessons to improve performance with the Gettysburg Foundation's Leadership Program.